Vanessa Thomas hails from Alberta, Canada via Lancaster, England. She’s a PhD candidate in the High Wire Centre and has worked in a lot of different areas, continually exploring the relationship between computing and sustainability. Sam: Welcome to Sustainable Lens: Resilience on Radio, a weekly show on sustainability topics brought to you by Otago Polytechnic. The show is co-hosted by Shane Gallagher and me, Samuel Mann. Shane’s not here tonight because I’m in San Jose, California at a conference. Each week we talk with someone making a positive difference and we try to find out what motivates them and what it means to see the world through a sustainable perspective, through their sustainable lens. 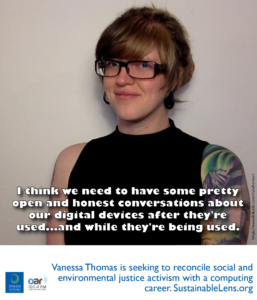 Tonight’s sustainable lens is that of Vanessa Thomas, who is a PhD candidate at the University of Lancaster and is a research associate in the Institute of Social Futures, also at Lancaster but she’s not Lancastrian. Where’d you grow up? Vanessa: I’m from Edmonton Alberta, Canada, which will probably give you a lot of context for why I do what I do if you know anything about the environment and oil sands and natural resource extraction. Sam: What did you want to be when you grow up? Vanessa: A fire truck but I’m not allowed to say that am I? Initially, in high school, I thought I wanted to be an accountant. Sam: You saw the light? Vanessa: I entered university and I took some entry-level classes, then I saw the light. I also took entry-level classes in computer science and learned that all of my skills in mathematics, which was what I always excelled at, could be applied to computing is well. Sam: You shifted into computing? Vanessa: Yes. During the first year I shifted away from accounting towards computing because I had thought that it was a more exciting and creative field for me to be in than just plain old numbers and maths and accounting. Sam: What did you think you were going to do with computing at that stage? Vanessa: I think I bought into a lot of the rhetoric around computing about saving the world through digital technologies, so I thought that I would get a job with Google. Google was just starting up at the time and it was really, really cool. Alternatively, I thought I would use my programming skills to make cool tools that would help people with their problems. Sam: Interesting that you described that as the rhetoric. I would say that the “cool tools” rhetoric is a lot stronger than any “saving the world” rhetoric, doing something innovative perhaps with digital technology, but I don’t know if there’s a common “saving the world” vibe. Vanessa: You’re right. I think retroactively I’m applying the saving the world rhetoric just because of the communities that I got involved with. Probably building the cool tools rhetoric was what I saw at first but that’s quite a long time ago. It’s over a decade ago that I started doing this, so it’s hard for me to remember exactly, back then. Sam: You said that Edmonton in Alberta, if I know anything about that, I’ll know everything about you. Okay. Pretend I don’t know anything about it. Vanessa: A lot of people won’t know very much about it, so that’s fair. Edmonton Alberta is a city of about a million people at this point. It was around 800,000 when I was growing up. It is heavily attached to the natural resource extraction industry in Canada and in Alberta specifically. Obviously, Edmonton is the capital city, so a lot of companies are based there, our government is based there, so policies around natural resource extraction are developed there, which means that groups that want to lobby for and against that are also based there and are also quite active there. Many people from Edmonton go and work in the natural resource extraction industries and those industries include forestry, they include oil. They also include fishing. There’s a large farming community as well, which you can argue is or is not a culture that sometimes gets looped in with natural resource extraction, if you consider crops, extraction, but some people don’t. In which case, it’s kept separate. Sam: What I want to know is, were the tensions that are implicit in that, apparent when you were at school? Vanessa: I would say it wasn’t clear to me when I was a teenager. I’m sure for some teenagers who were far more aware of those issues, it was obvious for them. For me, it didn’t really make sense. These issues came clear to me probably at about the time that I turned 20 or 21, certainly not when I was younger. Vanessa: I started getting involved with student groups on campus. Just through convenience and interest, I became involved with the Student’s Union at the University. They were a very open and welcoming group who shared a lot of nerdy interests with me and I didn’t know very much about how Alberta’s industries were tied to Canada in global economic issues at the time. They introduced me to a lot of those issues and retrospectively, I could see how that was linked to my upbringing and a lot of the issues in the area of the city that I’m from, which is quite a low income area, the city. A lot of people that I went to high school with graduated and chose to take jobs in the oil sands, or in forestry, or in the natural resource extraction area industries. I was one of the few people from my graduating class that went to university. There may be a cohort of like 20 of us from a graduating class of 700, who went to university. The rest all went off to low income housing and/or natural resource extraction industry jobs, things that didn’t require anything else after high school. Sam: Were you living at home or on campus? Vanessa: I was living at home. Yeah, with my parents. I couldn’t afford to go anywhere else. Sam: Did the neighbourhood think you were going off to a day job as a hippie? Vanessa: I didn’t look like a hippie at the time. I didn’t have dreadlocks at the time. My immediate neighbours, one was an old couple and they were just happy to see us go off and do anything and the other house had quite a transient population, so we didn’t really get to know them very well at all. It changed over a year or two, so I have no idea what they thought of me. They often didn’t talk with us. Sam: Around the family dinner table, were you bringing in new ideas or was it carrying on ideas, developing ideas that were already there? Vanessa: No. There was quite a lot of friction, especially when I became vegetarian and then eventually vegan. That caused a lot of friction. My family has a conservative bend to it, I would say. That’s the polite way of phrasing it, because Alberta, for a very long time, for 44 years had a conservative government in power. Everybody was just assumed to be conservative. You obviously supported the natural resource extraction industries. We had a large active beef farming community, so you obviously ate a lot of beef to support that. Yeah. Very conservative. The idea of having a vegetarian in the family was very off-putting. I remember vividly, a conversation with my dad where he asked if I would still eat my vegan burgers if it was cooked on the same grill as a beef burger, now that I had become vegan. Sam: Similar conversations in your computer science classes? Vanessa: No. No. Not at all. No. I had very few friends in my computer science classes. First and foremost, I was one of the few women. In one of the first classes that I took actually, one of my peers said that I never had to do any programming because I was female and I could get away with just letting the boys do the work for me. I didn’t actually make many friends in my computer science classes. I think that’s part of why I turned to the Student’s Union, because they were an open welcoming group who had similar ideas to me. They didn’t care that I was programming. They didn’t really care what I did for school, we just had these shared values. Sam: Within the academic frame, where there opportunities to explore the social side of computing? Vanessa: During my undergraduate, no. No. Not at all. Actually, I dropped out/got kicked out and took an internship, an international development internship, after three years in Ecuador doing something called ICT4D, Information and Communication Technologies for Development. I worked in a human rights nonprofit called Defensa De Los Niños, Defence of the Children. They helped support street children in Ecuador to do with all of the very many issues that they faced. I helped them set up their database and website, which in 2006 was very new for them. I helped them get email in their workplace. I trained them in how to maintain their website and maintain some of the computers that were also in the workplace. That opened me up to questioning the values of computing. Sam: You went back and finished your degree? Vanessa: I did. It was a very slow process. It took me until 2011 to get my degree. I started in 2003 and it took me until 2011 to get my undergraduate degree. I ended up taking courses in feminism along the way. I also took courses in management studies, communication studies, Earth and atmospheric sciences. I went looking for answers that computer science wasn’t giving me and that meant that it extended the length of the time I spent in my undergraduate but I also had a much more well-rounded and eclectic education as a result. Sam: Can you see a way of structuring a computer science degree that you wouldn’t need to go searching for those things? Vanessa: Absolutely. Yeah. If you included more flexibility in the course offerings. If you allowed people to take classes from the … Every University will obviously have a different departmental structure but if you we’re allowed to take courses in the environmental sciences and have that count towards your degree. If you we’re allowed to take courses from women’s studies or indigenous studies and have that count toward your degree, I think that would help. Sam: Having gone through the left-field way of eventually finishing a computer science degree. Then, you turned your back on all that and went to work in a bank. Is that right? Vanessa: Well, no. I was also working throughout that entire process because I needed to be able to pay for my education. I had been working for utility company for a bit, so they provided the power and water services in my city. I also worked for the government in my province, both for the energy ministry and the environment ministry. I eventually also tacked on a Master’s degree at the same time, to all of that. By 2013, I had earned a Master’s degree in interdisciplinary studies while working quite extensively in government and nonprofits and briefly, for-profits. Then, I quit all of that and went and worked in the Inter-American Development Bank for a few months before starting my PhD, so yeah I did get to the bank. Sam: What were you doing in the environment ministry? Vanessa: I was doing the same thing in the environment ministry and the energy ministry. I was the internal communications technology specialist. I helped set up and run their websites internally. I also was a member of a lot of projects helping employees feel more engaged within those ministries and to share their work because there was very low engagement. People were very angry and upset about what they were doing in those two ministries specifically. They had the lowest engagement scores of any of the ministries that the government delivered us, so I was trying to help that. Sam: What’s the structure of the government? Is the environment ministry to protect the environment or is it to provide a vehicle for extraction to go on? How does that tension sit? Vanessa: Yeah. There’s no real clear answer there. You can take the slogans that the government offers at face value if you’d like. I believe that, at that time, the slogan for the environment ministry … The full name for the environment ministry was Alberta Environment and Sustainable Resource Development and they were stewards of Alberta’s environment. However you wanted to take stewardship, you could. Sam: They’ve got all of the options stuck in that title. Vanessa: Yes they do. Yes they do. That is a very carefully worded title, I think for a reason. I think also, what they pursued policy wise was very different than what many of the employees had in mind with that ministry. Some of them were really keen on protecting the environment and making sure that Alberta had a long sustainable ecosystem with crop rotations and carefully planned forests that handle different animals as well as bugs and just had a proper forest ecosystem in place. Then, there were others who were more keen on making sure that we could just move those issues aside to make oil development a more easy process. It was a highly conflicting environment at Environment and Sustainable Resource Development. Sam: Were you based in the IT department? Vanessa: No. I was strategically based in the communications department so that we had more flexibility to do what we wanted to do. The IT department was very structured and had a very slow approval process for everything. When you want to help employees with engagement, you want to have quite a lot of quick movement at your fingers, I would say. You don’t want to be bogged down in bureaucratic structures that take a year just to get a website approved. Sam: Interesting that you’re a person who’s clearly driven by social justice and the environment. Having coming out with a computer science degree, in which you’ve got none of that, except which you’ve managed to shoehorn in. Did you then manage to find a job that enabled you to do both or was it still more computing? Vanessa: I wasn’t able to find a job that allowed me to do both, which is why I ended up pursuing that PhD that I’m pursuing. I’m still desperately seeking a way to reconcile the real social and environmental justice activism I used to be involved with and my computing career because they’re not two things that are easily reconcilable, as I’m sure you’re aware. Sam: Okay. You said you were working for some non-profits as well or at the same time. What was that about? Vanessa: Yeah. I also worked for another non-profit in Bolivia, which was called INFOCAL. It teaches people from low income areas, skills that they would need to be employed as a mechanic or doing food prep, just giving the skills that people from low income areas from Bolivia would need to find employment. I was also involved with a bunch of groups that help immigrants when they moved to Edmonton, helped them get settled. I was involved with something called the Sierra Club and also briefly Greenpeace in Alberta. I was the provincial coordinator for the Canadian commission of UNESCO’s Alberta presence and they did work on biospheres and also education support in rural communities. I was involved with just a peace organisation, the John Humphrey Centre for Human Rights. I was involved with a lot of different things. I didn’t sleep very much because in all of my spare time I went seeking the things that my job didn’t offer me. Sam: What were you trying to achieve? I’m sure there’s a path to a theme in there, but I don’t know what it is. Vanessa: Yeah. I think it put a lot of people off because I was doing a lot of things. The pattern for me was trying to … I don’t know what the pattern is. I still don’t know what the pattern is. You can help me with that baby. Sam: MSc in interdisciplinary studies, what was that about? Vanessa: Yeah. It was actually an MA, a Master of Arts in Interdisciplinary Studies. It was focused on something called Human Security, which is a United Nations development programme paradigm for looking at any sort of issue that you may have, any sort of problem around the world. There are seven pillars to this paradigm. We’ve got the economic security pillar, the food security pillar, to health security pillar, the environment security pillar, the personal security pillar, the community security pillar and the political security pillar. Those are the seven. You look in any sort of thing, you can even look at objects with those pillars and pick apart how they’re related to it. How does this microphone affect somebody’s food security, their access to food? How does this microphone affect somebody’s environmental security, their access to safe tree spaces, green spaces as well as water? Water’s typically linked with environment. It could be also put under food. Political security is another one. How does this affect whether or not somebody is going to be arrested? How does this link to their community security, which relates to their friendships with people? If I’m giving this interview now, now that this microphone is recording it, is this going to make somebody in my community hate me? Is it going to make them more accepting of me? All sorts of things. You pick apart anything with these seven pillars and that … As I was searching for, actually something quite like this paradigm, it came into my life through the Masters and it helped me see things differently. I think I was looking for something like it during my computer science undergraduate degree, which is why I went so broad with my extra classes and ended up taking a lot more than I needed. Sam: In your Masters, did you relate that in any way back to computing? Vanessa: I did in a couple of papers. I also related it to media systems because I feel like in a lot of … Media systems and computing are connected and have been for quite some time, so I linked them to both of those. Sam: What did you find? Vanessa: I found some not pretty stuff. That’s where I first started learning about eWaste – eWaste is electronics waste, so what happens to your electronic devices when you throw them away when you get rid of them. It’s a massive issue globally. It’s also where I first learned about some of the rare earth minerals that are in computing devices and the flows of minerals and materials that make up our devices. I had somehow not managed to put these pieces together before I got to my Masters. In part because I’d been distracted by the more common things that people are interested in. Environmental issues, I had been interested in, so at that time it was a lot about oil industry in Alberta and also plastics in the ocean. Food waste was a big thing that people talked about but I hadn’t thought to link all of that with computing. Sam: Because we don’t go out of our way to connect those things? Vanessa: I think so. I think we definitely don’t go out of our way to connect those things. Sam: We’re happily seeing these things as information appliances with no consequences, they just exist. Vanessa: Yeah. I think some of the rhetoric around those appliances aids that by saying that we’re putting our data in the cloud. I’ve actually had conversations with people where they think their data is up in some cloud. It’s got nothing to do with the ground and the planet. There’s no physical place. Sam: There’s no such thing as the cloud. It’s somebody else’s computer. People just don’t get it, do they? Vanessa: Yeah. I think some of the rhetoric supports that, that they don’t want you to think about it in a way. That sounds very, like a conspiracy theory because … Yeah. It does. That’s not how I meant for that to come out. I don’t mean it to sound like there’s a conspiracy but I think the wording around the cloud, I think we need to change it. I think we have to. Sam: What do we need to change? Vanessa: I think we need to have some pretty open and honest conversations about what happens with our digital devices after they’re used. I think we also need to have some pretty open and honest conversations about what happens with our digital devices while they’re being used. What is the cost of a Tweet? Why don’t more people know that? What is in the background of all of those Facebook feeds? How often are those algorithms making calls to a database on the other side of the planet and what cost does that have? Sam: You finished your MA, then what? Vanessa: I thought I wanted to go work for the United Nations, to try to tackle some of the big global issues that I had problems with, so I got a job at the Inter-American Development Bank, which is a smaller international development organisation. That was not a pleasant experience, so … I had also applied for some PhD’s at the time, thinking that perhaps I could spend some time researching the issues that I was interested in. Sam: I’d like you to take this positively but I can’t imagine you ever thinking that going to work for a bank was a good idea, even if it’s a development bank. Vanessa: Yeah. I completely agree. It was not the smartest decision, I would say in retrospect. I really actually desperately wanted to get out of the Alberta government, so I started looking for options and that was one of the first ones that came up. Sam: On a continuum of not-for-profit Sierra Club through to corporate bank, where does that sit on that continuum? Vanessa: Obviously, at the corporate bank end of things but they were at least a corporate bank interested in social justice and they really do support a lot of amazing projects in Latin America that would otherwise not have happened. Most of the bank is staffed by people from Latin America. A majority of the people working at the bank are from Latin America and they find projects that they care about because they affect the people that they care about. That’s certainly a gross simplification of it and there are bad projects funded and there is money wasted, of course, but I had also just witnessed the exact same thing at the government of Alberta, which was a non-corporate public sector organisation that I thought should have been doing a lot more good and at times it was. I was perhaps a bit lost and looking for answers and I thought that this organisation that had supported a lot of great projects in Latin America might have had some of the answers and they didn’t, so I pursued my PhD instead. Sam: Okay. You decided to pursue a PhD. Sam: Where did you look? Vanessa: In England because I was getting old and I didn’t want to spend eight years in Canada doing a PhD. That’s probably too honest. Also, England has a lot of really unique programmes, a lot of really unique interdisciplinary programmes, which is what I was seeking. I didn’t want to go back to feeling like I was stuck in one discipline and just needed to study one thing. I wanted to be able to draw on all of my very different knowledge bases and experiences and work that into the research that I was doing. I applied to a couple of different schools in the UK. When I met the people at Lancaster University, I immediately got along with them incredibly well. Their programme was the most radical of all of the programmes that I had applied to as well and it seemed like the right fit for me, so I joined them. Vanessa: It’s called the High Wire Centre for Doctoral Training. It is a post-disciplinary doctoral training centre, which means we’re supposed to be long beyond any sort of disciplinary confines. The people that it has attracted, I think, share a similar set of values to me. Sam: You took yourself off to England? Sam: Then what? Did you know what you wanted to do? Vanessa: Initially I thought that I would look at how digital technologies were being used in rural communities because sorry, I also grew up splitting my time between Edmonton and a farming community where my grandparents are based, in a small town in Alberta called Killam. It’s a side story, it’s not important. Anyway, I was interested in rural development so I thought I would see how digital technologies in rural development would be used, or would be linked rather. Sam: That didn’t last long then? Vanessa: No. Part of the fun of High Wire, is that they actually tell you to get rid of your initial idea when you enter. You go through this year-long process of basically being put in a blender with all of these other people from different backgrounds. I worked with somebody who had studied philosophy. I worked with somebody who had run an arts organisation and was a poet. I worked with somebody from China who had become a service designer and an ethnographer. There’s a fellow from Mexico who does audio locative. It’s called Locative Audio Experiences. I’ve worked with somebody who had done indigenous studies work with the Sami people in Scandinavia. I worked with a comic artist as well. We were all doing very different things and coming at our ideas with very different perspectives, so we were told to forget that initial idea that we had developed before we met all of these fabulous other people and to instead, come up with something new, with and amongst and even from them, so I did. Sam: What else did you try in that process? Sam: Of course you were! Vanessa: Of course I was! I had briefly thought about studying crisis informatics, crisis response in digital technologies. I actually ended up co-authoring a book chapter about that and I am still involved with an EU project related to this. I also dabbled in something called Smart Cities, which is a … Do you want to call it a paradigm? Can I call a paradigm? A current research and tech development industry paradigm trying to make cities smarter and by smarter they mean more full of technologies to help make people’s lives easier. Sam: For someone that’s questioning the value of computing, pumping more of it into a city wouldn’t seem to be a sensible place to start. Vanessa: Yeah. I think when I first looked at the marketing materials, I was interested in what they were trying to achieve by pumping more technologies into cities. I was very fortunate that right when I started to get interested in Smart Cities, a fellow by the name of Adam Greenfield published a book critiquing them. I read it and immediately connected with everything he said. He’s a brilliant man and everybody should look into his pamphlet called ‘Against the Smart City.’ That started to help me unpick a lot of the marketing materials, which is mostly what I had been exposed to. There was quite a large body of research at the time, also about Smart cities, but it was mostly about specific digital technologies and how they would address a certain “problem” within a city. None of it seemed to make much sense to me. I was very sceptical and then Adam’s book crystallised a lot of that scepticism. Sam: That’s what you’re not doing. Vanessa: I’m now finally, very happily, looking at how natural resource scarcity will affect people who do HCI. Vanessa: I should say, might affect people. Vanessa: Might affect people who are HCI researchers. Sam: Why is that of interest? Vanessa: Because I think that throughout this whole messy process I’ve realised that a lot of what I did in industry was HCI. I was working with people trying to design technologies to support them and help them, which is a lot of what HCI is supposed to be about. Also, I have always had this, not always, I’ve had for the past decade or so, this interest in environmental issues. I crafted this research as an attempt to unify these seemingly disparate threads in my life and try to crystallise something for me. It’s a very selfish endeavour. I want to know what I can do in the face of natural resource scarcity, as somebody who does HCI. Sam: What are you doing? Are you talking to people? Vanessa: Yeah. I’ve done two phases of research. I’m in the middle of the second phase. The first phase I interviewed people who repair and maintain retro computing technologies, so Commodores, super Nintendo’s, Sega Genesis, BBC micros. I was trying to talk with anybody who still repaired those. Then, now I’m talking with people who are currently active in HCI research and finding out what they do and how they do it, how they develop new things because I think the two groups are linked and that resource scarcity is one of the things that will link them. Sam: Are you particularly looking for people who are thinking those two things, the HCI, the Human Computer Interaction Research or practise and environmental stuff, the natural resource scarcity? Vanessa: Yes. Definitely. I work with people who are in sustainable HCI, which is, I think, the closest field dealing with these issues. I’ve also the Limits Community to be quite interesting because they are playing around with similar topics. Sam: Because, while there’s a few people doing that, the vast majority aren’t. Sam: What are you hoping to find? Vanessa: This is not going to be a very satisfying answer but I want to find answers for myself. I want to have a good idea of how I will be affected. I think, because I’m learning that the HCI community is quite a small, close-knit community, I think I will start by sharing my research amongst people who do similar things. Then, I will progressively get shoutier and try to integrate this into broader HCI discourses because I think that more people within HCI need to think about how what they’re doing relates to climate change and the environment. Sam: You’ve done some of those interviews? Vanessa: I have done some of those interviews, yes. I’ve got 17 done so far. I just started a couple of weeks ago. I intend to spend the next three months interviewing as many people as possible and having as many conversations around this is possible. Then, I will try to write it up. Sam: Has anyone said anything surprising so far? Vanessa: Yes and no. Most people aren’t thinking about, even if they’re going to maintain their data for the next 10 years because University requirements state that they have to, most people aren’t thinking about whether or not they should go back to that data and reuse it in an interesting way and how that relates to the environment or doesn’t, for some people. The more interesting things for me selfishly, have just been the differences between countries and the pressures that they face to deal with these things and the pressures that they face to publish interesting new work every year. That’s not a thing that I was expecting. Perhaps that shows how young and naïve I am within the field. I was expecting it to be a little bit more homogenous than it has been. Sam: -intergenerational equity with looking at changes on large scale over long time periods and messy wicked problems and so on. Sam: Has anyone got a solution to that? Vanessa: Not anybody that I’ve spoken with but I’m hoping that somebody might. Sam: You’re hoping that there’s someone out there? Vanessa: I think I have to hope that other people are thinking about this right now. I don’t have to hope that. I’ve had a lot of conversations with people who acknowledge that it’s a problem, they know that it’s a problem. They don’t like that there is this publishing cycle that they have to adhere to but they also would rather not be fired. They would also rather not lose access to their immediate colleagues and peers if they don’t do this because you have to make a living as well. They feel almost a sense of discomfort and inability to do anything in the face of this particular challenge. The ones that are saying this to me mostly are ones who are not super senior academics. Most of the senior academics … That’s not true, I’m generalising. I want to take all of that back. I had a conversation with a very senior academic from Cambridge. He’d given a presentation to a large group of people where he had been calling for more interdisciplinary researchers and he was saying that we need to rethink the publishing cycle and rethink how we value people within academia. He laughed in my face and said, “You’re too early. Come back in a decade. We might be able to accommodate something like that then but right now, no. Nobody’s going to allow you to do that.” To me, that interaction optimised the problem in academia. People want it, they will claim it to a large crowd of people. They will say, “This is the thing that we need to be doing,” but nobody’s making steps, they’re just deferring the problem to 10 years from now. Sam: You’ve been involved in a lot of different organisations. Sam: Probably more than anyone else on the planet and from a whole range of different areas mixing both environmental and social justice and culture and everything else. How come you came down to natural resource scarcity in your question? Vanessa: Because you have to have a very narrow question to get your PhD done. It was a practical choice. If I could … The paper that I’m writing about the retro computing people, it’s actually far more broad. It’s just resource scarcity that includes access to knowledge, that includes access to support, that includes access to the physical components that you need to replace broken things on your computer. For my thesis, I had to be quite narrowly focused so that I could finish it in the time and meet the requirements of this academic structure that is not ready for something more broad. Vanessa: I do not. I know that I probably should but I keep it quite flexible because of the broad variety of people that I speak with. Business sustainability is a very different thing than environmental sustainability, which is a very different thing than community sustainability, even though they’re all connected. If that makes sense. I wish that I had an easy to ramble off thing so that … I’m probably going to need to articulate one at some point in the near future and it’s going to be very difficult for me. Sam: What do you say when somebody says, “We’re computer scientists, this is not our problem”? What’s your line into it? They typically respond with more questions and then through that questioning process, I try to provide them what information I have on hand and that changes regularly as well because I think new research comes up quite regularly about the environmental impact of computing. Yeah. I try to fit that into the conversation as they’re responding to me. Sam: On the scale I’ve just invented of one to 10, where one is optimist and 10 is pessimist? Vanessa: Oh. Ah. Scales, again. I fluctuate between probably one and 10, quite regularly, even earlier today, depending on a lot of things. I have to be optimistic because I’m just in my 30s and I know I have a long, long trail ahead of me. I think if I was pessimistic all of the time I would not have the energy to get myself out of bed in the morning but I also see a lot of exciting things happening. I see cool projects like to Restart Project. I see cool projects like Fairphone. Fairphone’s a great project. Things like that give me hope and make me quite optimistic but then, talking with lots of researchers who don’t think about the environmental impact of their computing at all makes me quite pessimistic. Attending presentations by large search companies who talk about wanting to provide abundant access to the Internet for everybody and then not having them acknowledge that the environmental impact of that. That makes me quite pessimistic as well. Sam: The whole paradigm, not just of computing but of technology and business itself really, is make new products and sell more stuff. Sam: Are we kidding ourselves? Vanessa: By trying to think about environmental issues related to that? Sam: No. About turning around that sight, that discipline, that science, that industry that’s behind it, the business. Vanessa: I don’t really care if we’re kidding ourselves. I feel like somebody has to be saying it. Somebody has to be trying to raise these issues with big business or it will never change. I don’t know if in the long term this will matter, I don’t really care. I just feel like I have to do it. It feels like the right thing to do and beyond that I don’t really care. I should care because I know that neoliberalism is the problem and that we should try to bring it down but I also know that I am one person. Sam: Some questions to end with. What is your sustainable superpower? Vanessa: Yeah. Laughter? Am I allowed to say that’s my superpower? Sam: I’ve written it down, so that’s what it is. Vanessa: Perfect. I feel like I have to laugh in the face of some of the things that make me incredibly pessimistic. That’s probably what keeps me optimistic. Vanessa: Oh, wow. Quitting my job at the government of Alberta and pursuing what I cared about. Sam: Do you consider yourself an activist? Vanessa: Yeah. That’s a question that I’ve always struggled with. I should, I should consider myself an activist and sometimes I do. Right now I don’t. I don’t feel like I’m doing enough. I’m just doing a PhD and some research. I don’t feel like I’m enough of an activist right now. I used to be. Sam: Do you see a long-term future where you can be an activist? Sam: Do you think that you’ve cracked it? Through your myriad of things that you’ve done there’s been a separation between computing and your, let’s call that part that bit of the activism. Sam: Do you see a long-term future where you’re going to be able to bring the two together? Vanessa: Yes, and I’m trying to right now. I just submitted an environmental impact of computing … Yes. I just submitted a digital technologies and climate change proposal to the government of Canada, a competition about a month ago that closed. I’ve made it to the top 10 for that particular competition, so there’s a very good chance that this submission I have is going to affect policy in Canada, getting the government to think about how their computing regime is linked to the environment. That’s my first step. Sam: How’s that going down in Edmonton? Vanessa: I will find out when I’m home in about a week and I start chatting with some people. Vanessa: Yeah. That’s a great question. What does motivate me and get me out of bed in the morning? There are the typical motivations that everybody has. I need to eat food and survive, those things. I need to have friends…like motivations, whatever. I am motivated by … I hate this question. I’m so terrible at answering it. I should have an answer to this question and I don’t. I have an idea of what I want to see from the world and I’m motivated by pursuing that idea. It’s a broad, messy, complicated idea that draws in all of these different threads, so it’s not an easy thing for me to articulate. I do end up styling it a bit when I am talking with different people but that gets me up in the morning. Pursuing that gets me up in the morning. Sam: Maybe it’s always only ever going to be a broad, messy, complicated idea. Sam: If there was a silver bullet, simple idea, we would have fixed it already. Vanessa: I would agree. Yeah. Sam: Good. You can stick with, “Oh, your answer was good there,” remember that one. Vanessa: I can give you a flippant answer or a very serious one. Vanessa: Okay. I would wave a magic wand and we would all be transported to Jurassic Park and it would be a fabulous, exciting time with dinosaurs. Sam: Except we would get eaten. Vanessa: They need food too. Dinosaurs need food too. I’m not a species-ist, I’m not. Yeah. No, if I could wave a magic wand and make one thing happen it would be that the world would be a less unequal place for everyone and the environment. Sam: Do you have any advice for our listeners? Sam: It’s this last question, it’s a free hit. Vanessa: I know. I know. I’m sorry. The advice that I used to give when I was a mentor for young women entering computing was that you should feel and it’s such a piece of advice from a place of privilege, you should feel that you can pursue the things that you care about, even if they don’t fit into the nice, normal, clean, clear structures that are centred in front of you. Even if you are an engineer, if you want to learn about knitting, go learn about knitting. If you are a nurse and you want to learn how to fix a car, go learn about fixing a car. That would be my advice. Pursue the things that you’re curious about and be curious. Be curious, please. Vanessa: Yeah. Thank you. I’m sorry that was so rambled. Sam: All of the best stories are a ramble. Sam: You’ve been listening to Sustainable Lens: Resilience on Radio, a weekly show on sustainability topics brought to you by Otago Polytechnic. The show is co-hosted by Shane Gallagher and me, Samuel Mann. We broadcast on our title access radio, oar.org.nz and Podcast on SustainableLens.org. On SustainableLens.org, we’re building up searchable archive of conversations with people from many different fields who are applying their skills to a sustainable future. In our conversations we try to find out what motivates them and what it means to see the world through a sustainable perspective, through their sustainable lens. Tonight’s sustainable lens was that of Vanessa Thomas, variously from Lancaster and Alberta, Canada. She’s a PhD candidate in the High Wire Centre and has worked in a lot of different areas, continually exploring the relationship between computing and, let’s just call it sustainability. Although, she didn’t. You can follow the links on Sustainable Lens to find us on Facebook and you can listen to Sustainable Lens via iTunes for free and it goes out to lots of other party places. Please do like us on Facebook. It keeps the wolves from the door and it means we don’t have to go and get a job working in the oil sands. That was Sustainable Lens. I’m Samuel Mann. I hope you enjoyed the show.